Get a Caribou gift card for setting an appointment to replace any equipment or swimming pool liner! Get a Target gift card for setting up the pool opening! Now offering a free swimming pool opening with any new liner purchase! Now offering a free pool float with any new liner purchase! #1 Have a new liner installed in the month of April and save $400! 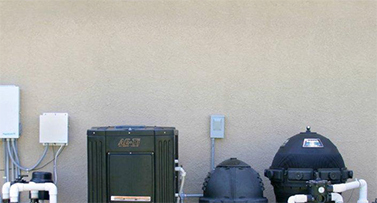 #2 Have a new pool heater installed in the month of April and save $400! #3 Buy your new Raypak Brand Pool Heater for the upcoming season. Pay now and save more than $600.00! Buy your new Hayward or Pentair Brand Sand Pool Filter for the upcoming season. Pay now and save more than $250.00! Price includes standard outdoor installation in April 2016 and removal of the existing pool filter if needed. Price includes sand filter media and gravel. Price includes Multiport valve. Applicable taxes are extra. March – Pool Equipment Special! Install the Zodiac iAQUALINK Automation to your pool and be able to control all your equipment, temperature, and lights from your smartphone. The iAQUALINK system is now on sale from Sundays Off with savings of $500.00. iAQUALINK allows you to control your pool anytime and from anywhere. Use the app for your smartphone. It’s user-friendly and Sundays Off will help set up your account in minutes. With the complete 24/7 control you can check or change the pool at your convenience. April – Pool Equipment Special! We proudly sell Merlin, KAFKO, Tara, and Plastimayd Brand in-ground pool liners. We will measure and custom fit the liner to your exact pool size and shape. 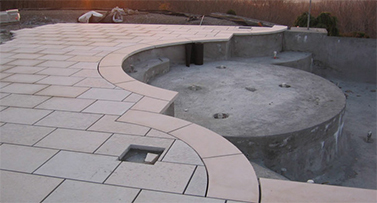 The pool liner is CAD-designed and custom manufactured to be the best fit for your swimming pool. Vinyl liners come in several different thicknessses from 20 to 30 MIL thick. All our vinyls provide U.V. and antibacterial protection built right into the vinyl. There is an incredible array of patterns to choose from. Order now and Sundays Off will include the pool opening for free! Let our experienced installers go to work for you and make the pool look and feel brand new.